The club's year finished off with the usual flurry of activities before moving into the Christmas break. 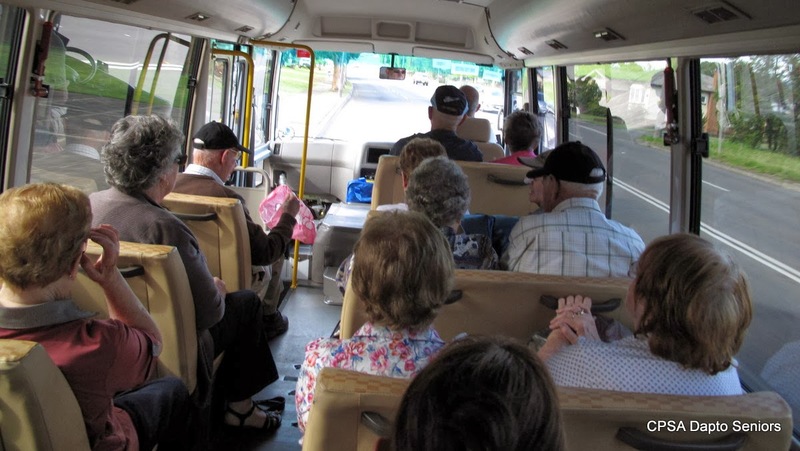 A full bus left Dapto for the Shoalhaven at the beginning of December. 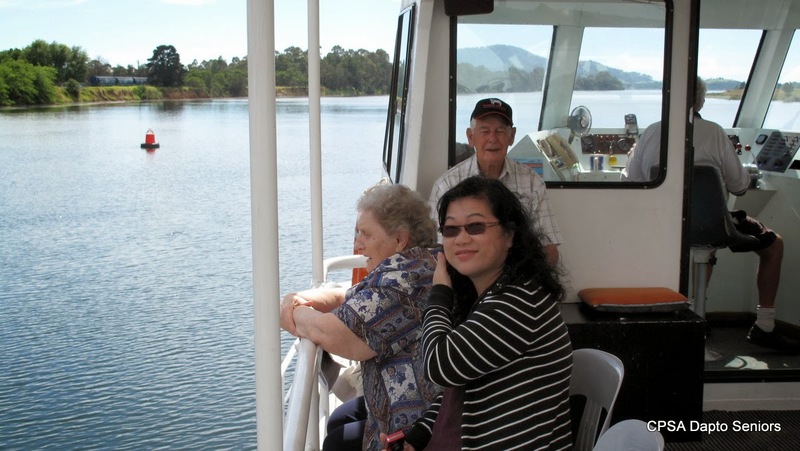 Waiting for the group was a fabulous three hour lunch cruise travelling down the Shoalhaven River to the Crookhaven River to pick up a fish and chip lunch at Greenway Point before sailing back to Nowra. 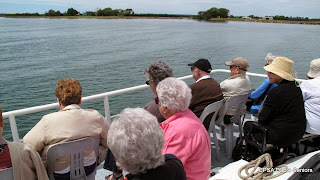 Naturally the first item of business once everybody was on board was a cup of tea and some cake before settling down to watch the scenery float past. 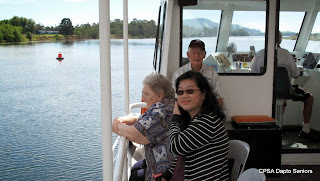 It was a lovely day, the weather could not have been kinder to us as the boat moved between the green banks of the beautiful Shoalhaven. 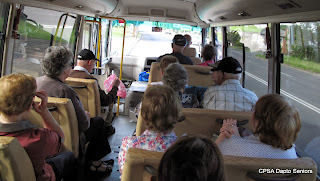 What a wonderful day out and a fitting finale to a year of bus trips to interesting and beautiful places. 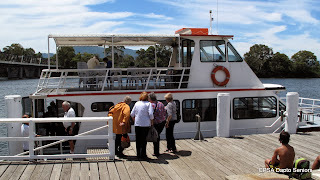 We look forward to another year of such fascinating outings. Bring on 2014. To complete the year the Dapto Seniors Christmas Lunch was held at Dapto Leagues Club in the Sinclair Room. On arriving every member put their lucky ticket in a barrel before they were each presented with an enormous tin of Quality Street lollies. 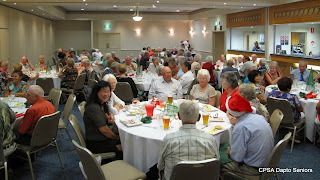 Nearly 100 members attended the lunch which was a very gratifying turnout for our organiser. It was generally agreed that the food was delicious, the choice of pork or chicken suited just about everybody, there were no complaints! Once the meal was over the lucky door prize draw went ahead with so many prizes it almost seemed as if no one went home without a prize. Afterwards it looked as if people were reluctant to go home as the smiling, happy members lingered to wish each other a Very Merry Christmas and a Happy New Year. The first meeting and AGM of 2014 is on the 16th January. The election of a new committee will take place at the AGM and membership fees are due too. The committee looks forward to seeing you all again for another fun year with CPSA Dapto Seniors. If you are not a member then please join us you will be welcomed with open arms. Membership forms/envelopes will be available at the meeting or you can print your own in advance using the link on the 'Club Activities' tab at the top of this page. Thank you for your patience but at last the 2014 meeting and event dates are now available on the 'Club Activities' page also the club's brochure has likewise been updated and can be downloaded from the same page.